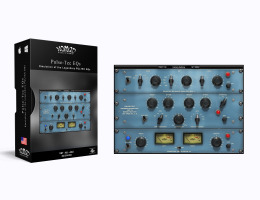 The PULSE-TEC EQs includes the legendary Pultec Mid-Range Equalizer MEQ-5 and the well known Pultec Program Equalizer EQP-1A into a single high quality plug-In, the PULSE-TEC EQs. The PULSE-TEC EQs sections can be enabled or disabled individually or used simultanous for full range analog equalizations. We added an analog Pre-Amp section which adds an Input Level and Output Level controls as well as a simple 'Clipper' limiter at the master output section. The PULSE-TEC MEQ-5 Mid-Range Equalizer section is designed to add Body and Presence to your recorded tracks, Highlight or Subdue a vocalist where the vocal is already mixed with the orchestra, improve the quality of voices by alternating their fundamental and overtone relationships. The PULSE-TEC EQP-1A Equalizer section will add a wide range of equalization curves provided makes it possible to boost the very low or very high frequency notes of the orchestra without 'muddying up' the middle register instruments. Continuously variable controls permit changing the amount of the equalization or sustained tones without step in level or noise. Vintage Switch - Designed to add the 'Soul' of the original hardwarewe used for modeling.